This is a complete training video in three parts, with detailed instructions and insight from Kevin while training at Bev Francis’ Powerhouse Gym. This video takes you through Kevin’s exact training regimen, supplementation and lifestyle for a week. Witness the Reign of the King! 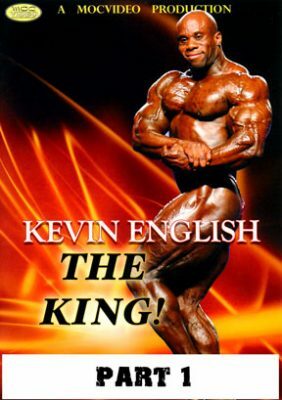 Kevin English is “The King”, undefeated in years, he is the most dominant bodybuilder to step on stage under 212 pounds. This massive three-part video was filmed prior to and during the New York Pro 2012, which Kevin won against Sami Al Hadad and Jose Raymond. Filmed over a week at Bev Francis’ Powerhouse Gym, see Kevin’s exact workouts explained in detail. Included is footage of Kevin preparing at the hotel, backstage at the NY Pro, stage footage of the show. You also see his post-win footage. See the private life and see a different side of one of the most dominant bodybuilders to ever step on stage. Watch Kevin English in detail as he prepares for the 2012 New York Pro. This is a complete training video in three parts, with detailed instructions and insight from Kevin while training at Bev Francis’ Powerhouse Gym. This DVD takes you through Kevin’s exact training regimen, supplementation and lifestyle for an entire week. Shot three weeks out, see Kevin pose, workout and visit the chiropractor, take his dog to the park, cook food and much more. See footage of Kevin’s victory at the New York Pro! Includes backstage and pump room footage and scenes around the show of all of the athletes. See Kevin‘s on-stage performance and his massive battle with Jose Raymond and Sami Al Haddad. Includes the awards and backstage after the show.